At the time of writing Changi has 3 active terminals, terminal T1 that opened in 1981, T2 that came up in 1990 and terminal T3 that opened in 2008. They can handle 66 million passengers annually between the three terminals. It is connected to 320 cities in 80 countries. • Designing the Airport with an assumption that travelers spend a lot of time at the airport. • Designing the facilities keeping in mind the airlines that use the Changi Airport as a hub. • Designing the services for passengers who spend substantial time. • Keeping the interest of all stakeholders and all kinds of passengers in mind. • Each terminal is designed on a theme highlighting the emphasis on design – T1 is based on tropical city, T2 has lots of gardens and T3 has a unique ceiling design that lets the light in but keeps the heat out. • Efficiency is built-in in the processes – It takes you less than a minute to go through the immigration, the baggage arrives as soon as you arrive on the belt. • There are so many activities available for the passengers apart from the regular shopping and eating options that most airports offer. Red my detailed post on Changi Airport – What to eat, buy, see & experience. • Terminal T1 was re-built in 2012 and a budget terminal has been demolished to give way to T4. • All the business class flights, cheap flights and even last minute flights are available with a lot of care and conveniences. • Terminal T4 will open in 2017 with a capacity to handle 16 Million passengers. It would use technology to enable passengers to not just self-check in but to also self-tag the baggage and drop the baggage at designated points. • Jewel Changi Airport – an iconic multiple purpose complexes will open in 2018 designed by Safdie architects who also designed another icon of Singapore – Marina Bay Sands. It would house world’s tallest indoor waterfall. 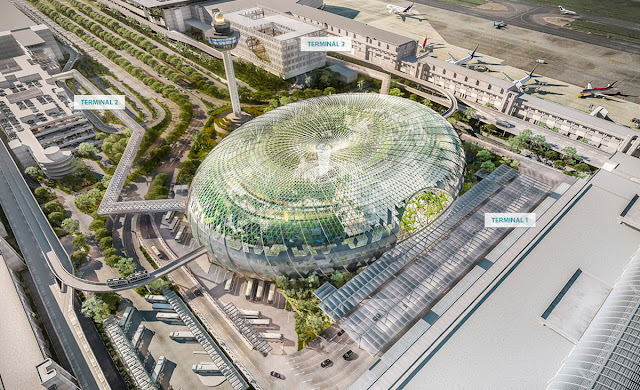 Jewel Changi Airport will have 5 floors above the ground and 5 below the grounds. • Terminal T5 is expected to open in 2020. • Changi has been winning the ‘Best Airport Award’ – more than 500 such awards and 27 times consecutively by Business Traveller. It seems they do not want to let go of these tags to anyone else. Singapore has always been a shy and happy-go-lucky city with smiles all around. The people in Singapore are always welcoming and warm with their greetings. When such country handles international relations in the airports, you can be assured to think that they are going to be amazing even in their services at the airports and the flights. So just relax and plan a perfectly cheesy trip to Singapore. Known for their skills on body developments like Spas and treatments, they will surely make the best of your day whilst you are there. Imagine how much pleasing the place could be where the Airport itself is so ultra-modern. So just stop thinking much about the budget as you have the availability of cheap flights these days. Start booking and start voyaging through the clouds. Adios!